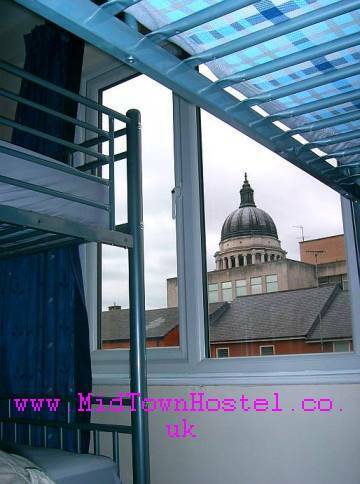 We offer budget accommodation in the very centre of Nottingham. You will be staying within one to three minute walking distance from town centre Market Square, clubbing districts of Lace Market and Hockley, Victoria and Broadmarsh shopping centres. 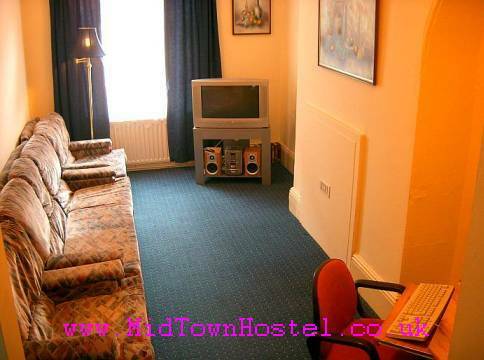 The MidTown Hostel is Nottingham's best accomodation for backpackers, students and sports groups. Central location. You can actually see City Council buiding from a bedroom window. Newly decorated rooms with double glazed and sound proof windows for comfortable rest. Lounge area with sofas, TV, Hi-Fi and free internet-connected computer & "Sony" playstation. Free coffee and tea for our guests Lockers. Kitchen with dining area. 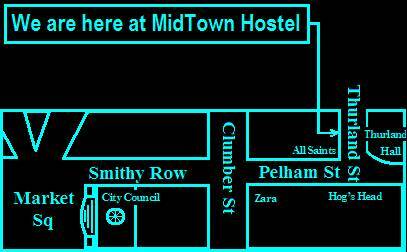 MidTown Hostel is located only one minute away from Market Square in the very centre of Nottingham. We advise SkyLink: a 24 hour bus service from Nottingham East Midlands Airport to Nottinghams city centre. As you step out of the bus you see Market Square right in front of you. It takes half an hour on average and costs around GBP5 for a one way ticket. Alternatively you can hire a taxi at around GBP35 one way. Walk out through the main entrance and turn right. Follow the Canal street over the bridge, onto set of traffic lights, and go through Broadmarsh shopping centre. Follow the street to Market Square (check the skyline for the tallest building with a flag on top). Follow the signs to Broadmarsh Shopiping centre. Go through it. Follow the street to Market Square (check the skyline for the tallest building with a flag on top). Tram passes through and stops at Market Square. Cosy dormetries for 4 people. A Twin private room also available. Access to the Internet. In the heart of Nottingham's culture, shopping, bar and clubbing centre. 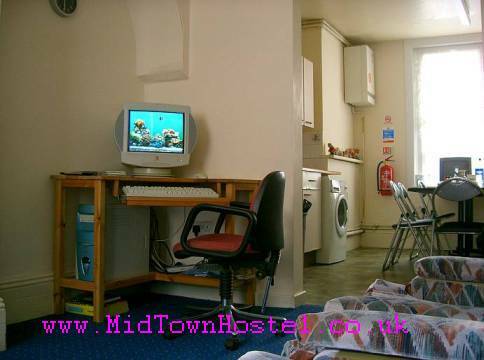 3 minutes away from Broadmarsh Bus Station, and 5 minutes away from Central Train Station. Close to tram stops. There is no booking fee, but will charge every person for 1 night stay should you fail to cancel within 72 hours of your expected arrival. Groups of 4 and above will need to put a deposit or down payment. ATTENTION: Groups of 4 and more from UK should contact us first by phone before booking their places (security requirement). Failure to do so can result in cancellation of your booking and no booking fees will be refunded.